How does the Supreme Court interpret the Constitution? 1 How does the Supreme Court interpret the Constitution? 2 How would you decide? The language in many parts of the Constitution can be interpreted in more than one way. The Fourth Amendment protects citizens against “unreasonable search and seizures.” If you were a member of the Supreme Court, how would you decide what is “unreasonable”? Would you look up the words in the dictionary to decide what they mean? Would you try to think how the Framers would have decided the case? Would you take into consideration such ideas as basic rights and limited government? Would you be influenced by historical, political, and social changes that have occurred since the Constitution was written? How much importance would you give to previous Court rulings on this issue? 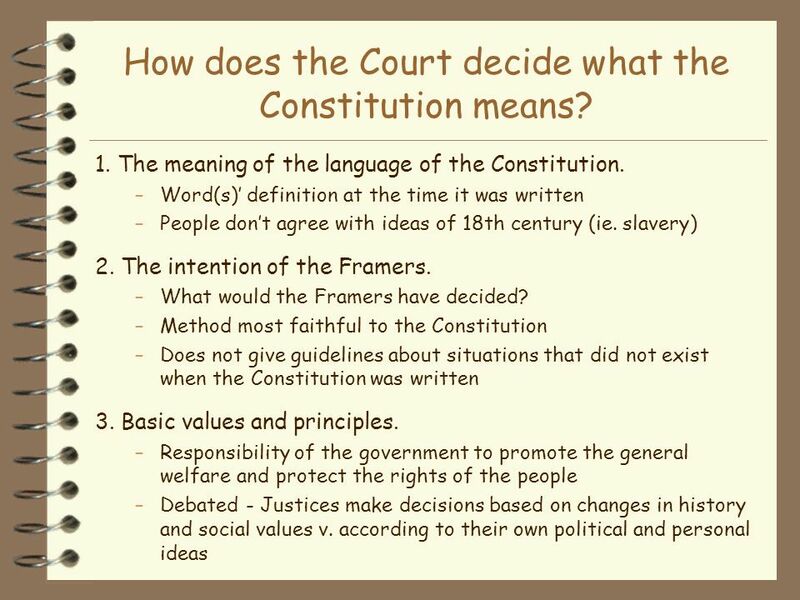 3 How does the Court decide what the Constitution means? 4 Discussion How can the Supreme Court decide cases involving subjects, such as wire-tapping which did not exist when the Constitution was written? Would you agree with the following statement by Charles Evans Hughes who was Chief Justice of the Supreme Court, “We are under a Constitution, but the Constitution is what the judges say it is.”? Why or why not? 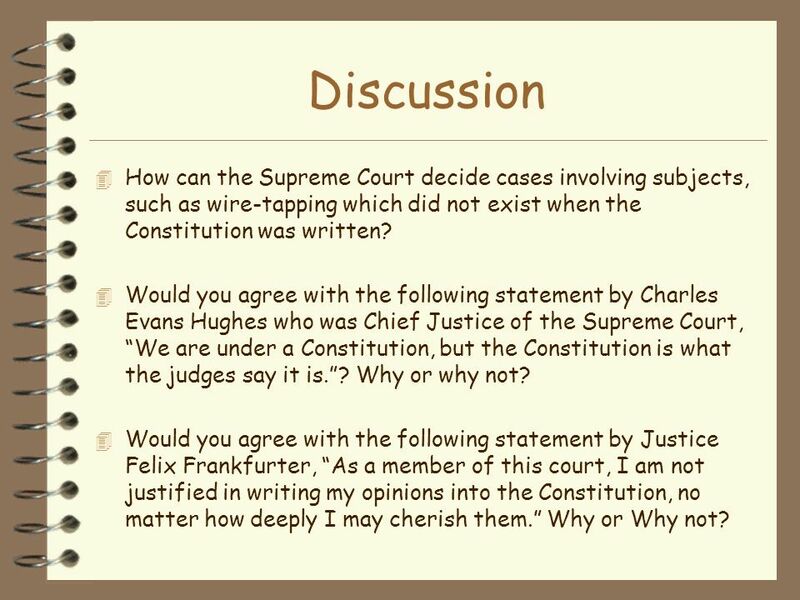 Would you agree with the following statement by Justice Felix Frankfurter, “As a member of this court, I am not justified in writing my opinions into the Constitution, no matter how deeply I may cherish them.” Why or Why not? 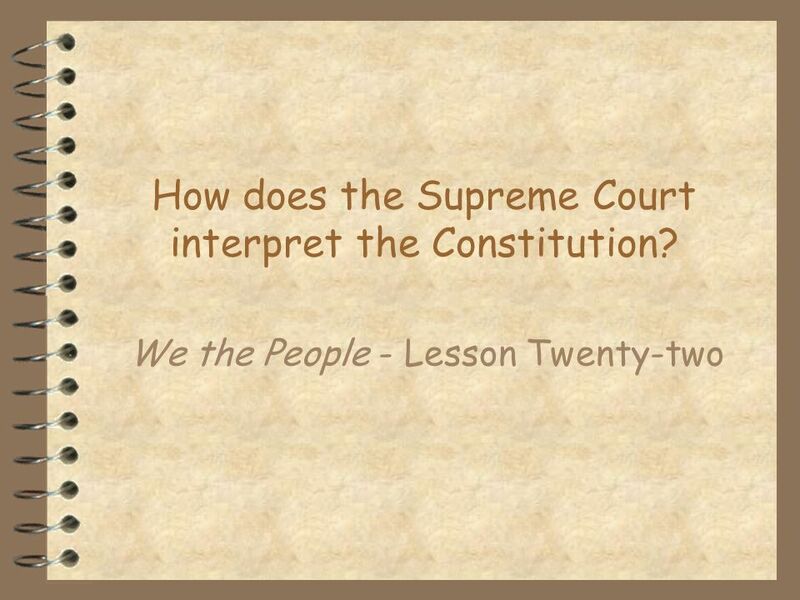 Download ppt "How does the Supreme Court interpret the Constitution?"  Record in Agenda: 1) Notebook check next class– all notes & class activities should have been completed and glued into your notebook. Check the Absent. What are the main principles of the US Constitution? The Federal Courts Chapter 16. Democrat/ Republican The 3 Branches Vocab The Constitution Political Facts. Judicial Decision Making Artemus Ward Department of Political Science Northern Illinois University. The Constitution & the American Political System Unit Test Review Choose That Branch Order, Freedom, or Equality Unit Terms Line- Item Veto Is it Constitutional. The Judicial Branch. United States v other nations Only in the U.S. do judges play such a large role in _______________. ________________- the right of. 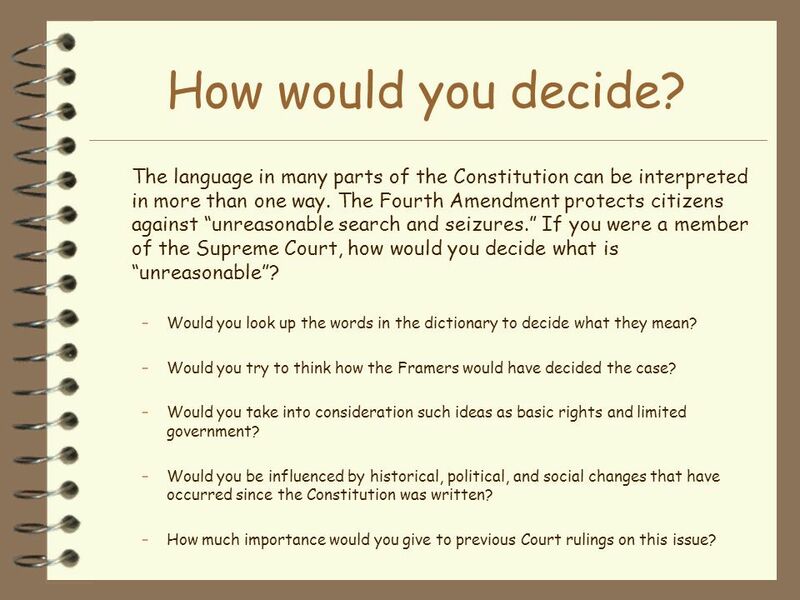 Unit 3 Supreme Court Judiciary – The cornerstone of our democracy American Government. The Courts, the Constitution, and the Bill of Rights: Due Process © 2003 Constitutional Rights Foundation, Los Angeles, All rights reserved. The Constitution of the United States. This is the Preamble (or introduction) of the Constitution. Changes on the Constitution The power of the 14 th Amendment Amending the Constitution Amending the Constitution = Difficult process Amending the Constitution. The Judicial Branch Clip art from © North Carolina Community College System.